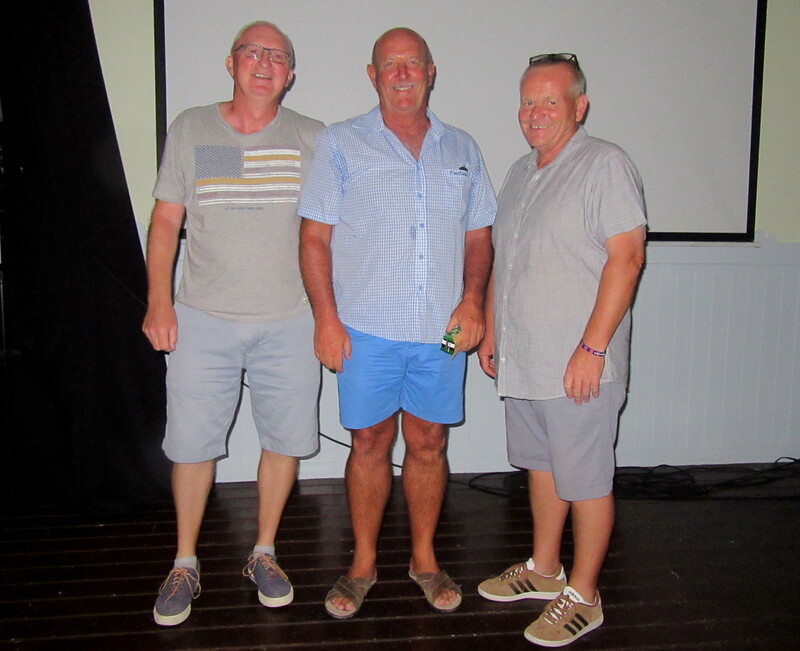 Phil Cooke is doing a fantastic job as stand-in captain with most of the committee absent at the moment…………. 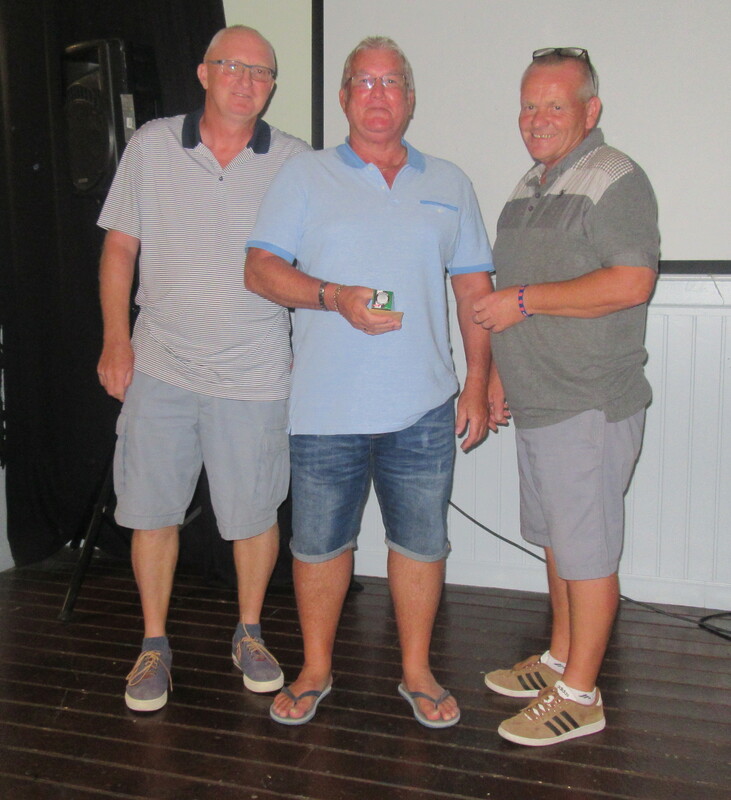 This week was the 2nd Dublin Crystal of 2017 (sponsored by Paul Culligan), with 49 players suffering in the intense heat! Perhaps the low scoring reflects that. 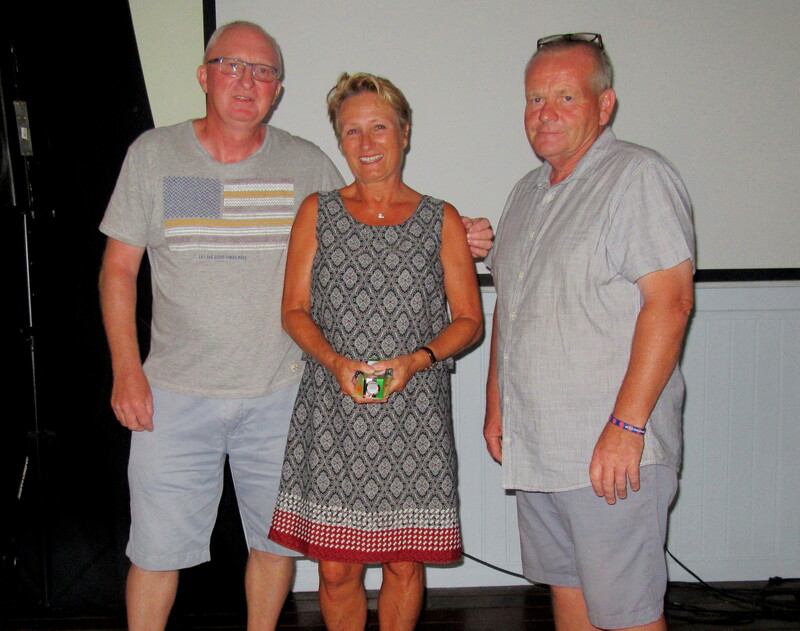 John was the clear winner……………………..
Fran was second, but not near enough……………..
Dave Lloyd has had a fantastic summer, prizes every week………..
with Fran in 2nd place overall, Kirsti took the ladies prize…………. 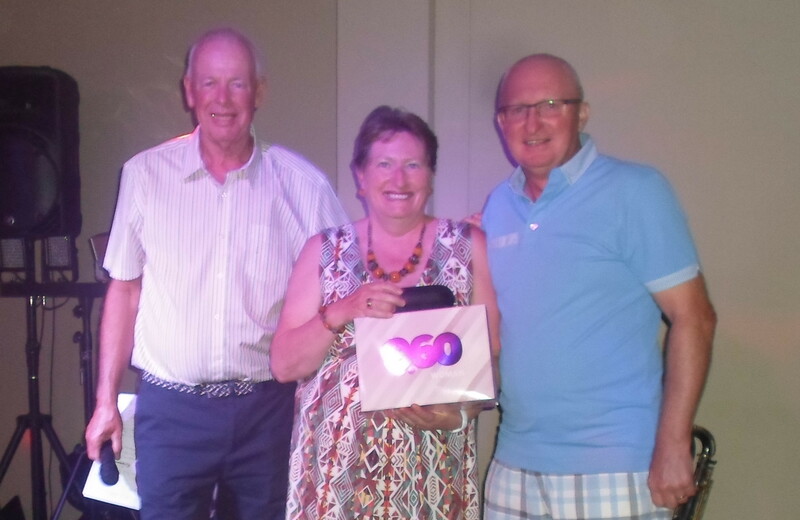 I thought I had snapped a burglar leaving the Clover, but it was Milt, in the prizes again, but not for golf this week – it was for the raffle…………..
And a few general shots from the course which is looking good………………. 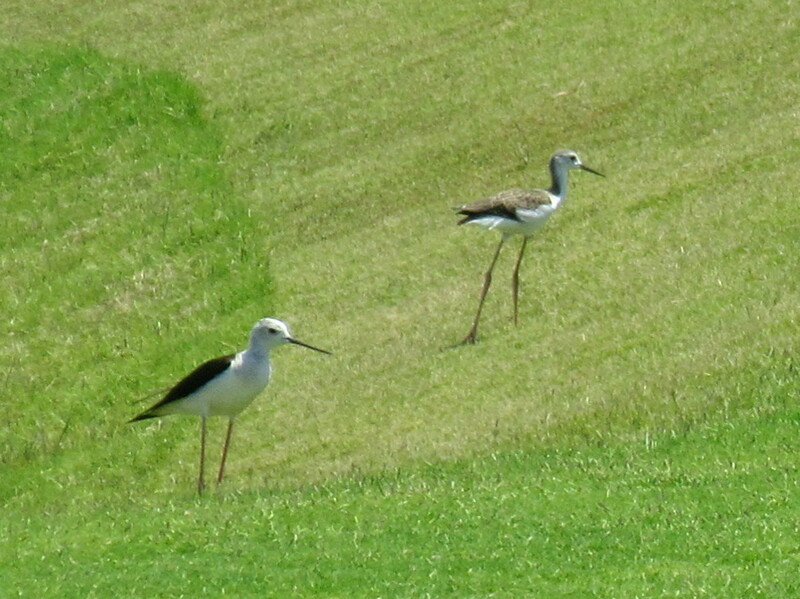 and our friends the black winged stilts are back, although they don’t like us………………. 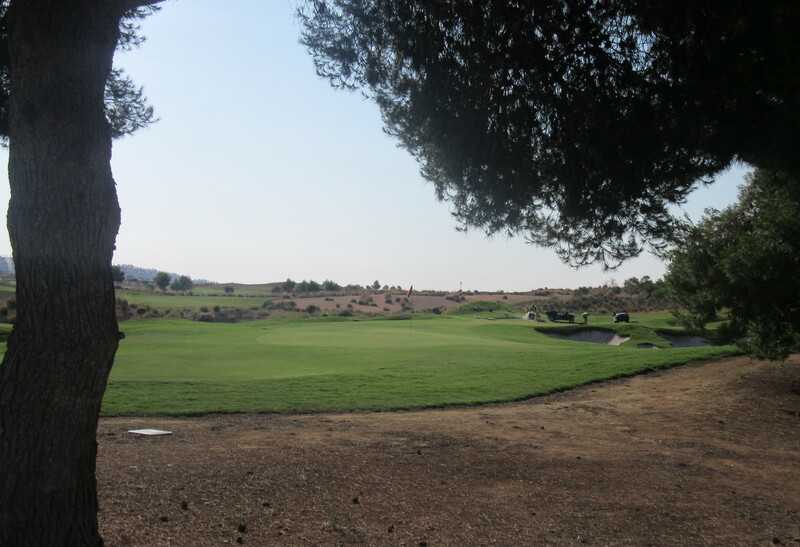 This week the work on the greens has progressed to the 3rd – looked like a good long putt from the ladies tee! about 40 yards from the ladies? 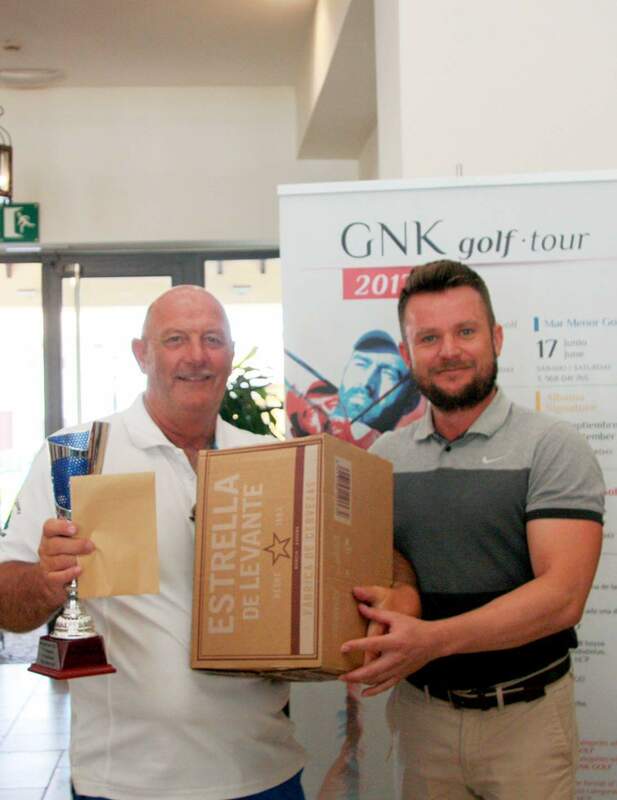 Another winner for CDAGs – Dave Lloyd finished 2nd in the GNK 6 course challenge (at Mar Menor this week). 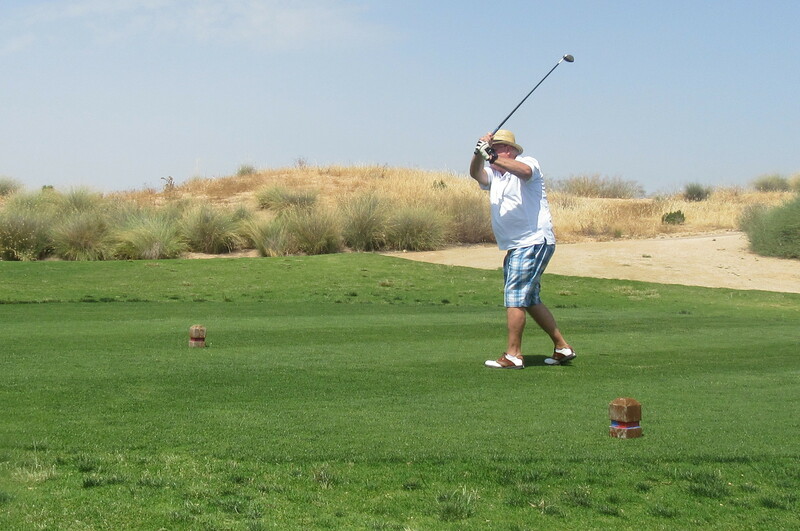 Went round in 70 gross (par) which normally would be good enough to win. But good for his overall position in the summer championship. 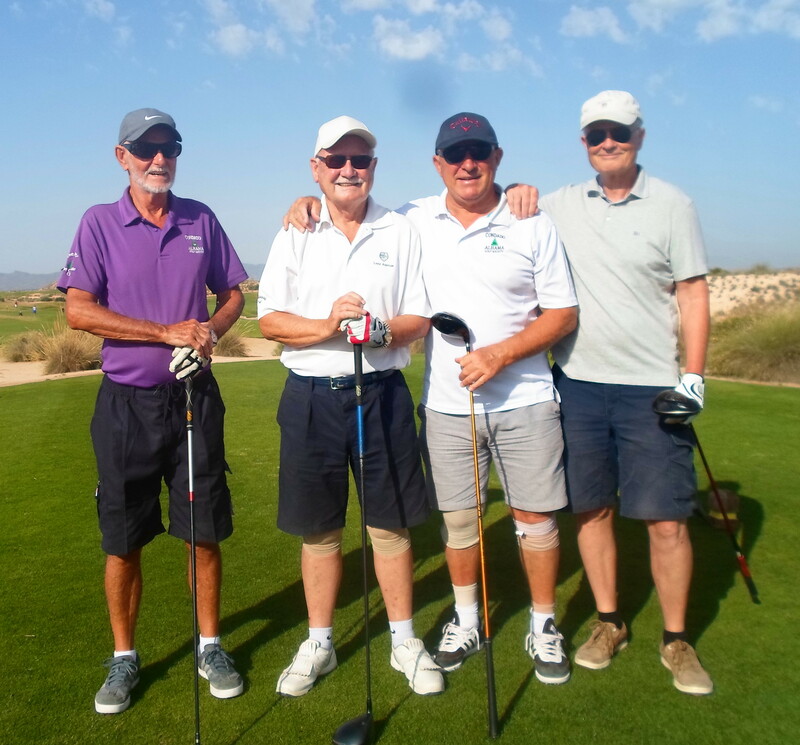 One last thing – one of our most popular members, Peter Reeves, has recently undergone a hip replacement, and while the operation was a success he has developed further problems and is seriously ill in hospital. 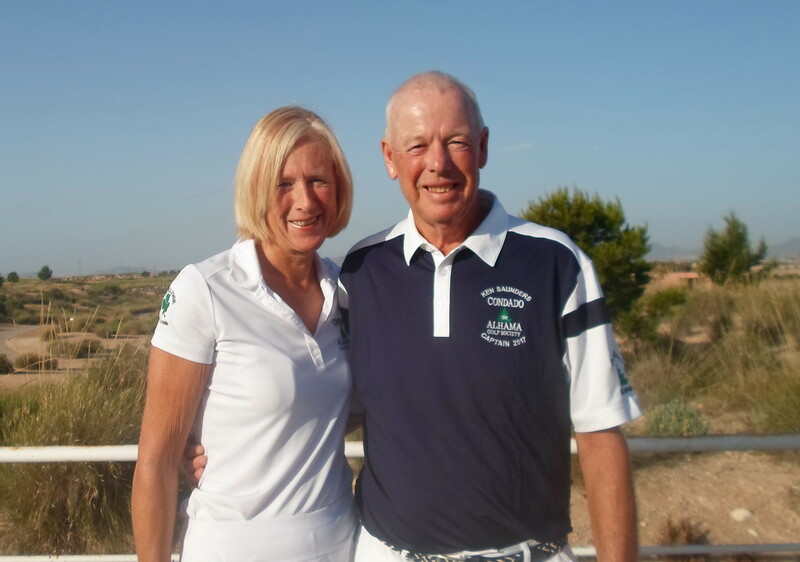 We send our best wishes for a full and speedy recovery and want him back on the course with us. 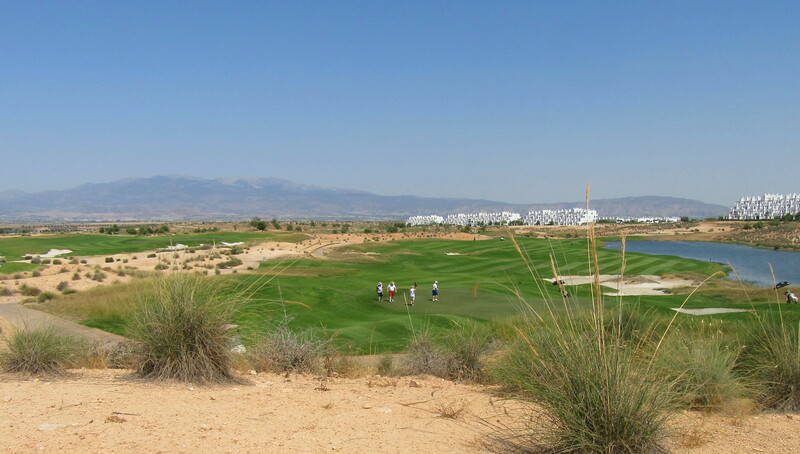 40 players this week in the hottest day for golf this year. A couple of no shows, and some couldn’t last the distance and walked off. The penalty for failing to turn up without a valid reason is removal from the online booking service, with a second offence incurring suspension from the competitions. 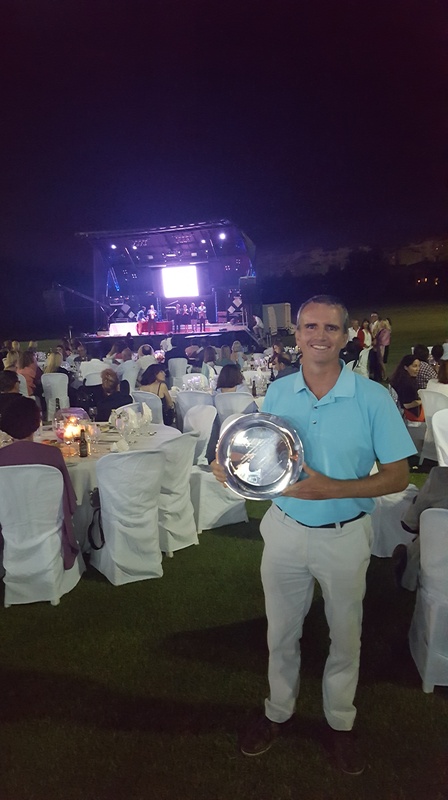 Chris King had his second win in a week following his victory in the Annual Absoluto federation competition (2nd category) held over 2 consecutive days at Altorreal and El Valle . 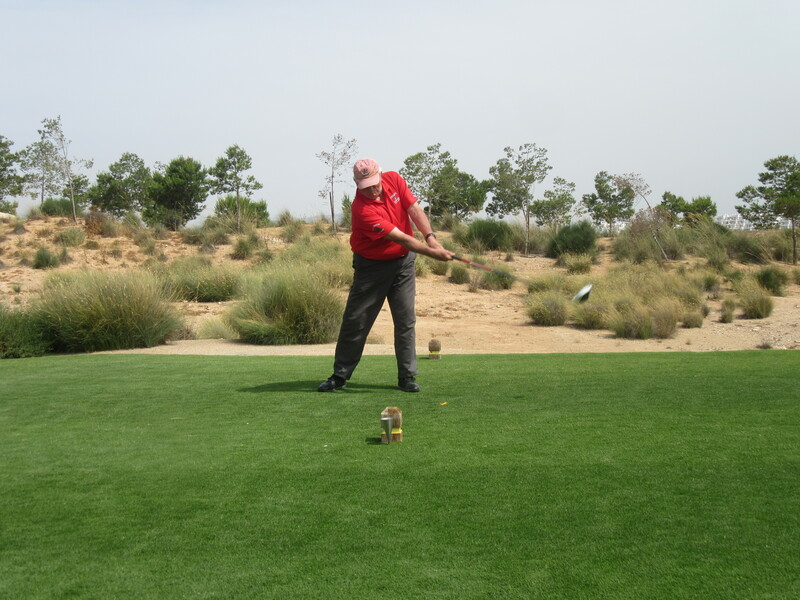 He posted gross scores of 75 and 80 to go clear by 4 strokes. The last 2 years he finished 2nd and 3rd in the category 1 section. 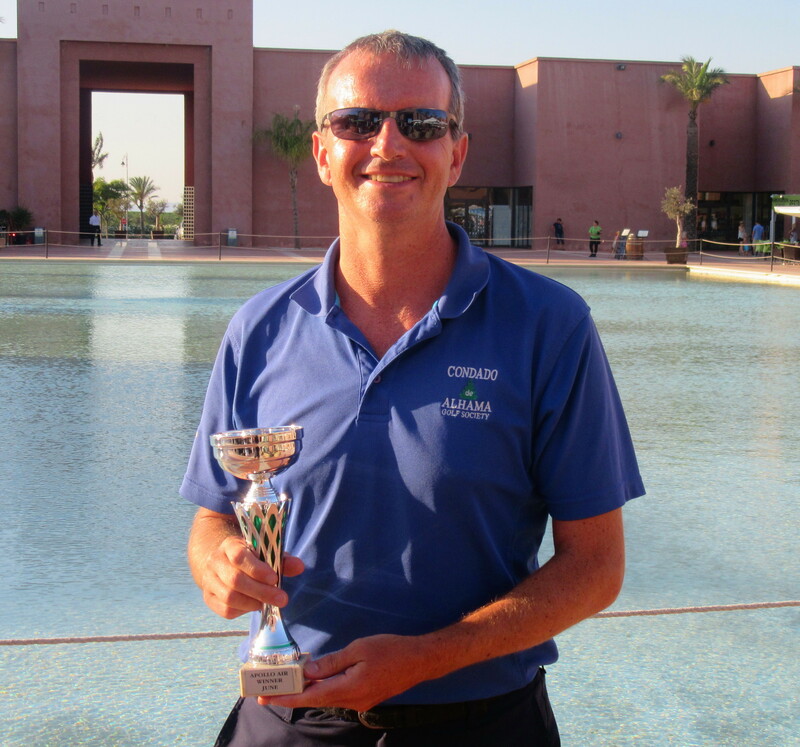 Chris shows off his trophy……………………. 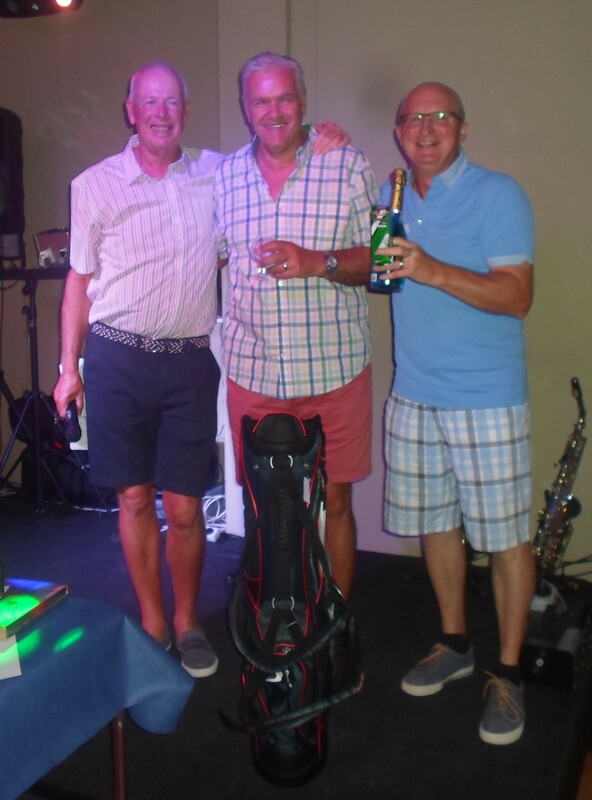 a great score off a low handicap today……..
last week I posted a photo of Milt representing the losers……..this week he bounced back to take the first division prize! 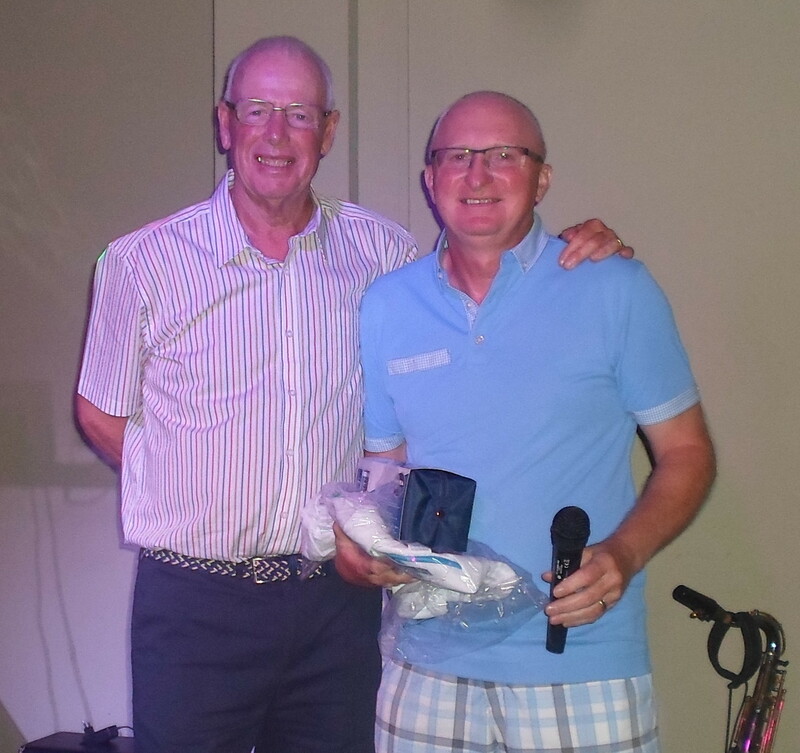 Sausage Dave won the 2nd division by 4 strokes. 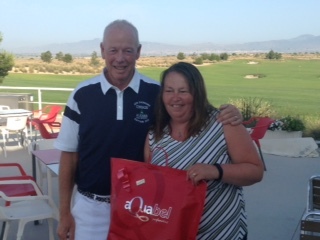 and a fine 37pts won Twyla the ladies division…. 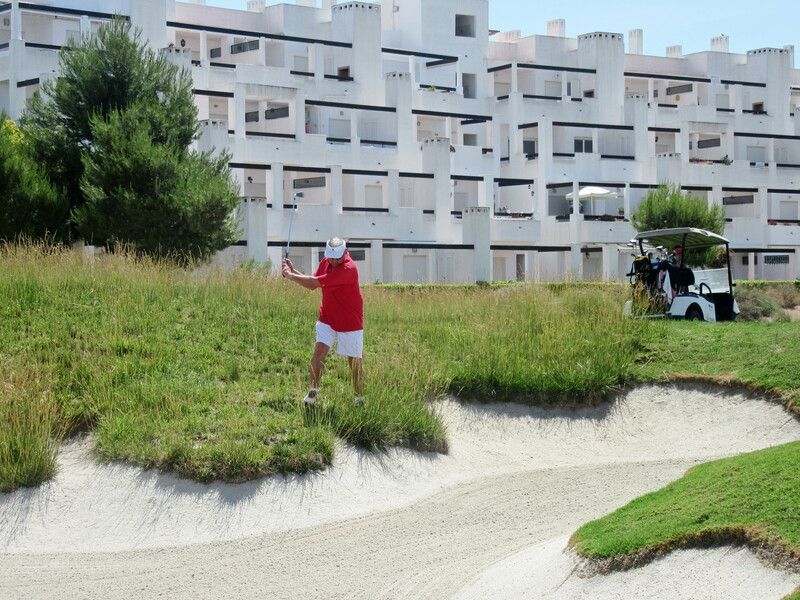 Ivor Abernethy found an awful lie at the edge of the fairway bunker on hole 12……….. 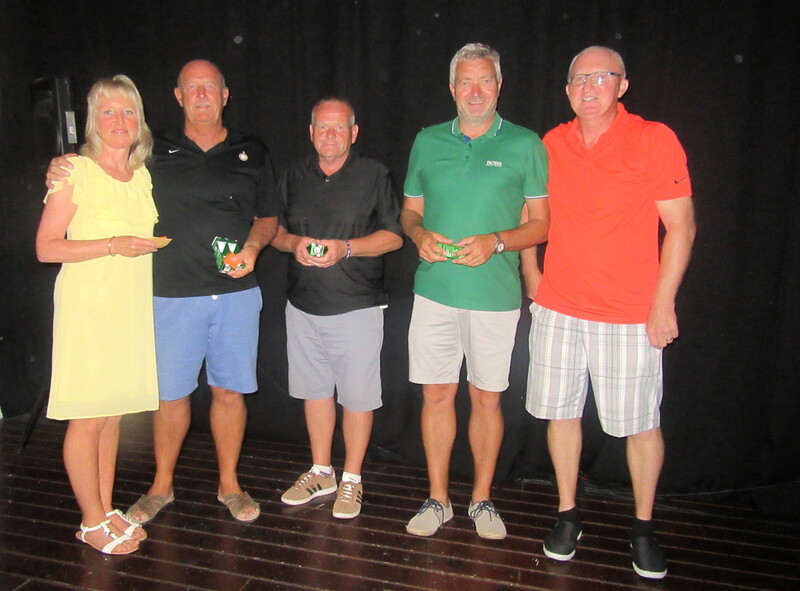 This week’s Apollo Air was the 6th this year so some players now have reached the point where their best 6 scores count for the annual overall trophy. See masterscoreboard under LINKS for the current standings. 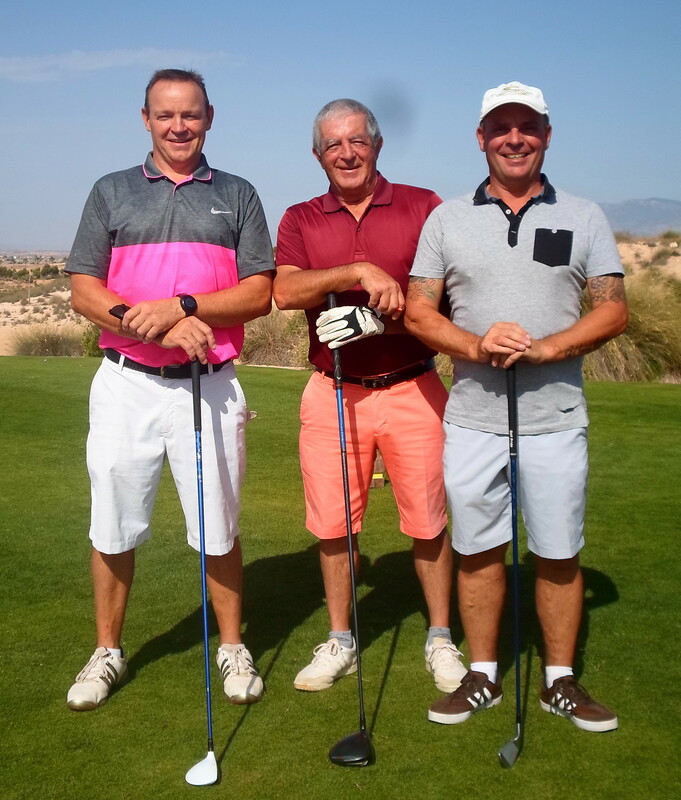 If you play more than 6 in the year, your lowest score will drop off your total (Kevin Smith is the leader at the moment, but Chris King’s total is looking ominous when he gets his 6th round in!). 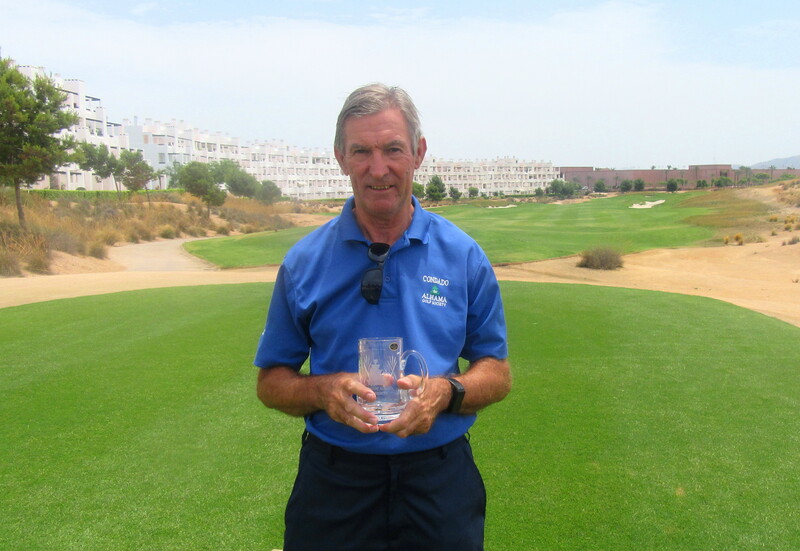 Next week is the Dublin Crystal individual stableford. A plane is on it’s way to Toronto, when a blonde in economy class gets up, moves to the 1st class section and sits down. The flight attendant watches her do this and asks to see her ticket. She then tells the blonde that she has paid for economy class and she will have to sit in the back. The blonde replies, ‘ I’m blonde and beautiful, I’m going to Toronto and I’m staying right here’. The flight attendant goes into the cockpit and tells the pilot and the co-pilot that there is a blonde bimbo sitting in 1st class with an economy ticket and won’t move back to her seat. The co-pilot goes back to the blonde and tries to explain that because she has only paid for economy she will have to leave and return to her seat. The blonde replies ‘ I’m blonde, I’m beautiful, I’m going to Toronto and I’m staying right here’. The co-pilot tells the pilot that he should probably have the police waiting when they land to arrest this woman who won’t listen to reason. The pilot says, ‘You say she is a blonde? I’ll handle this, I’m married to a blonde – I speak blonde’. He goes back to the blonde and whispers in her ear, and she says ‘Oh, I’m sorry’ and gets up and goes back to her seat in economy. The flight attendant and the co-pilot are amazed and ask him what he said to make her move without any fuss. I told her first class isn’t going to Toronto’. 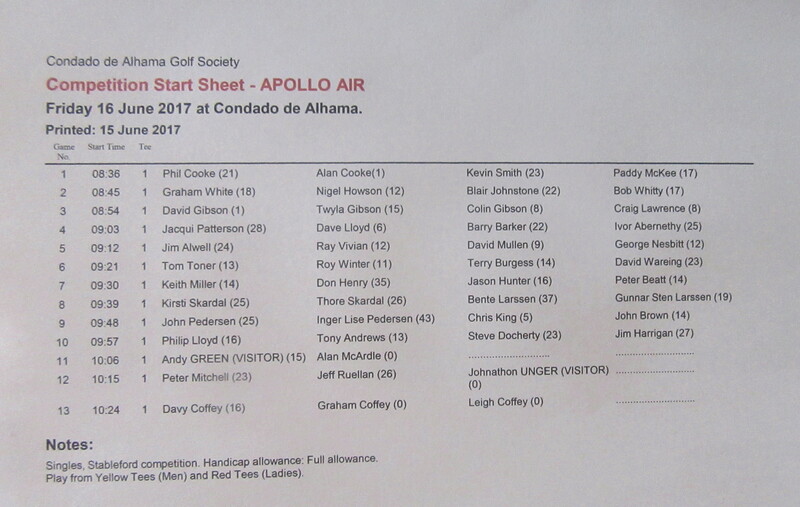 The weekly start sheet can be accessed by all members at http://www.masterscoreboard.co.uk so maybe I will not post it on Thursdays. 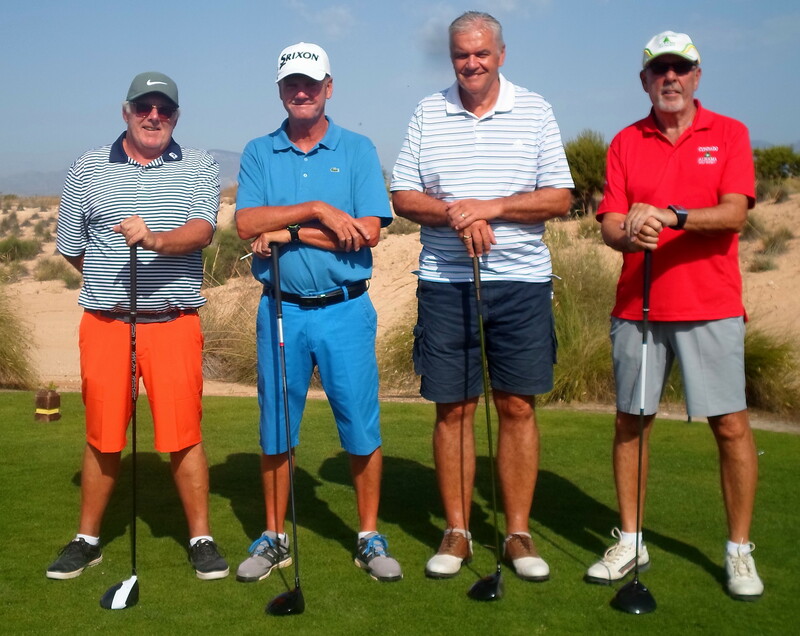 .This week was a team event – 2 scores counting on the first 6 holes, 3 on the second 6 and all four to count on the last 6. 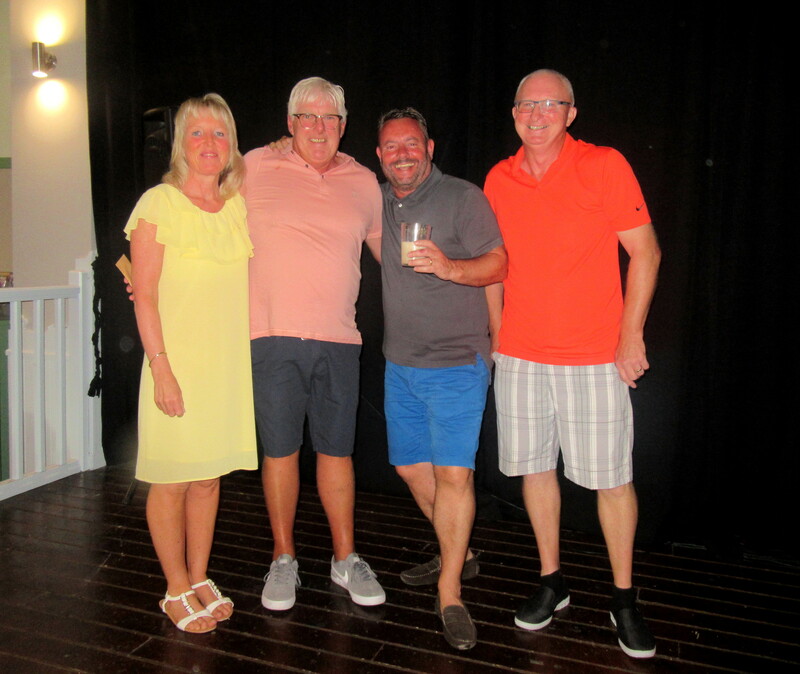 Kim, Dave, Kev & Chris won easily…………..
only Roy and Mark present to collect their 2nd place prize…………. 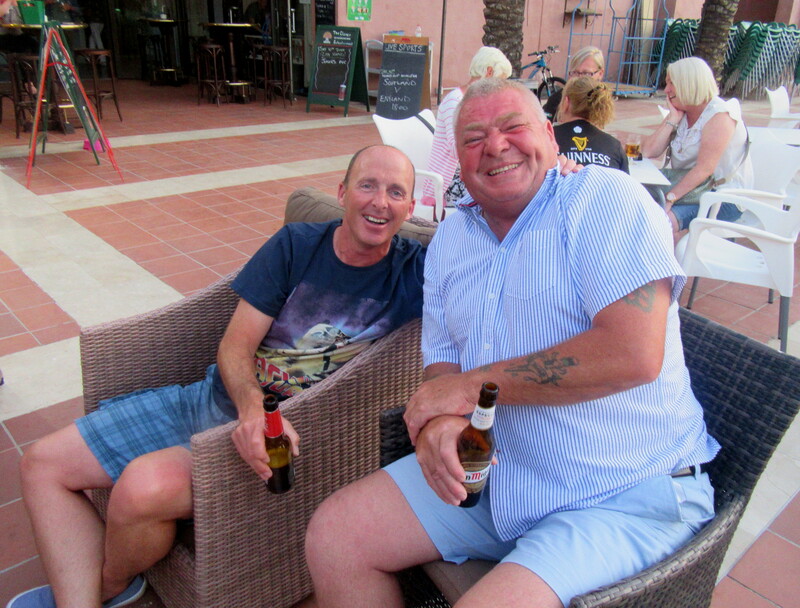 Milt (Keith Miller) complained that I never took a photo of him – so here he is representing all the losers with Mike Dean……………. 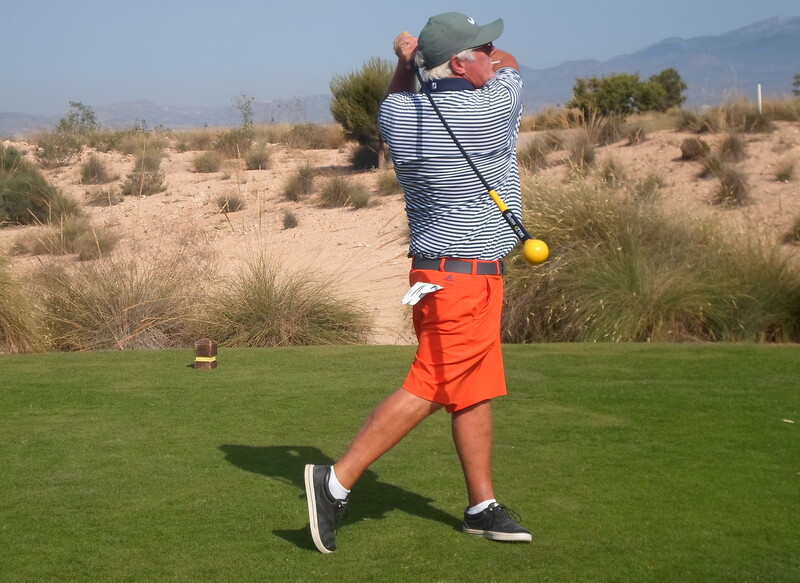 Peter Mitchell has a new swing after a few lessons with Alvarro……. 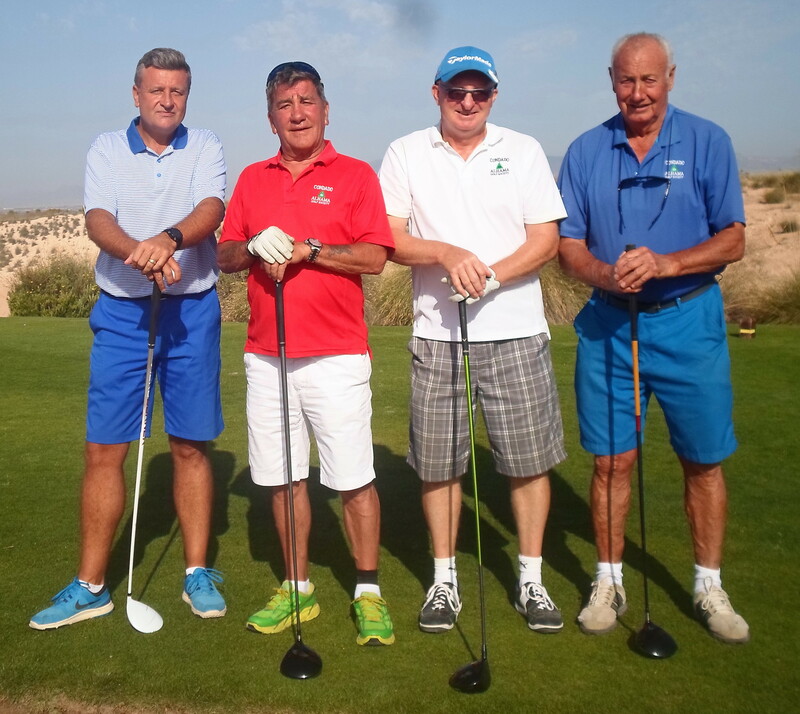 Tom McAdam, Peter Deans, John Don and Jon Donaldson on 15…..
it was slow for the later starters, here Lis and Jan Jaksobsen have to wait on 14…………………. 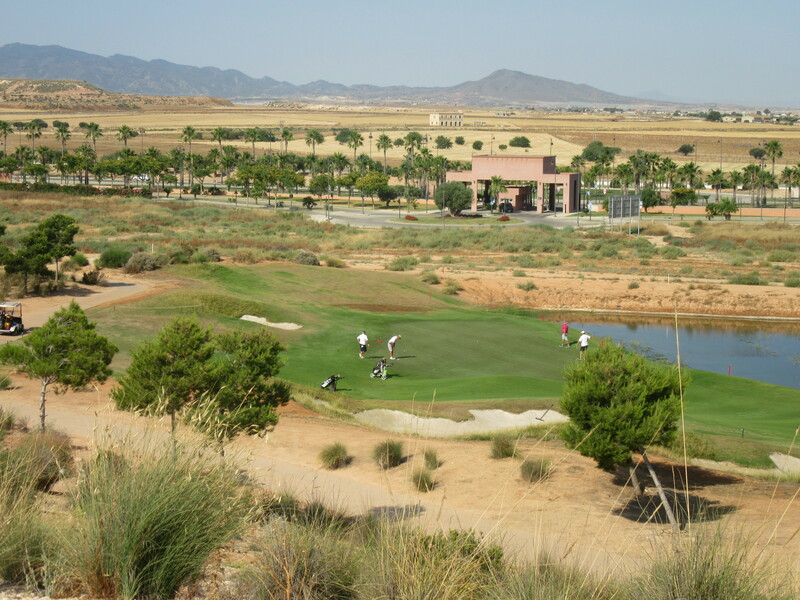 Next week is the June Apollo Air individual stableford. 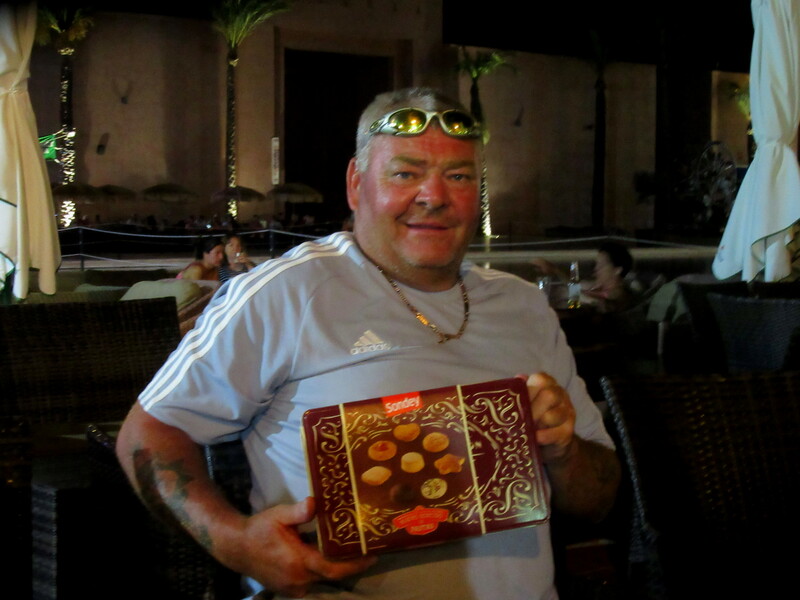 Roy Winter and his training device…………. 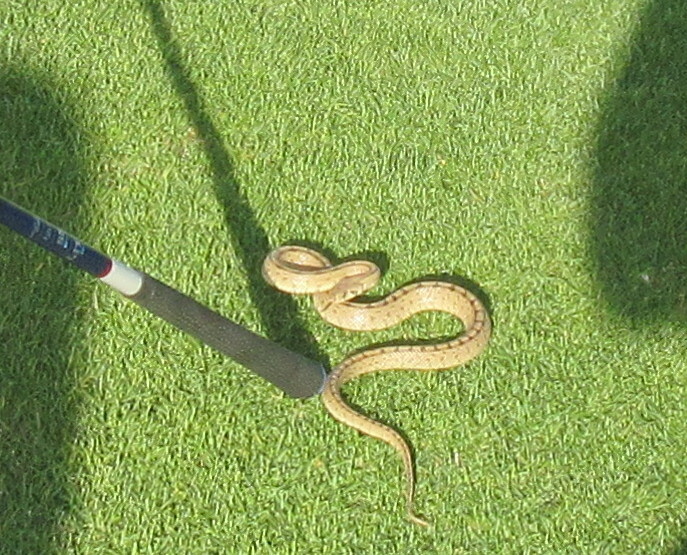 Barry Answer playing from the ladies tee on 13? – no wonder he beat me………. 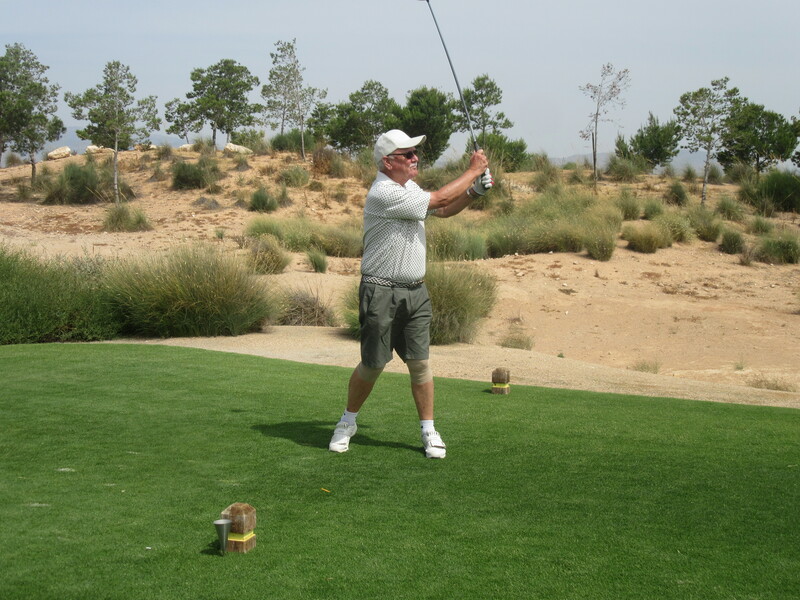 Ken drives at 17 and was the closest before Phil Cooke……………. 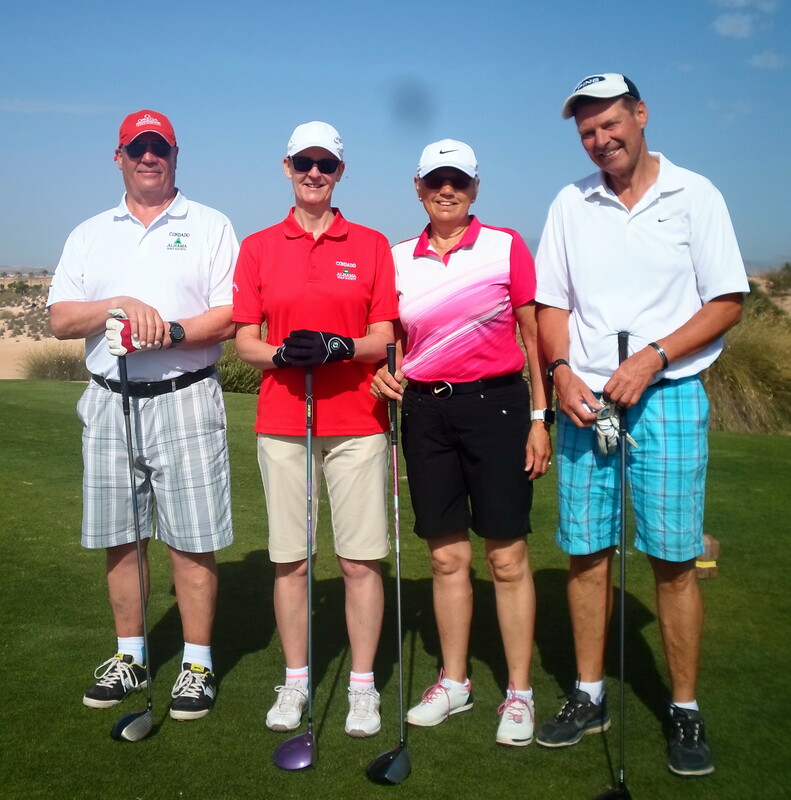 have a great holiday you have deserved your break………………. 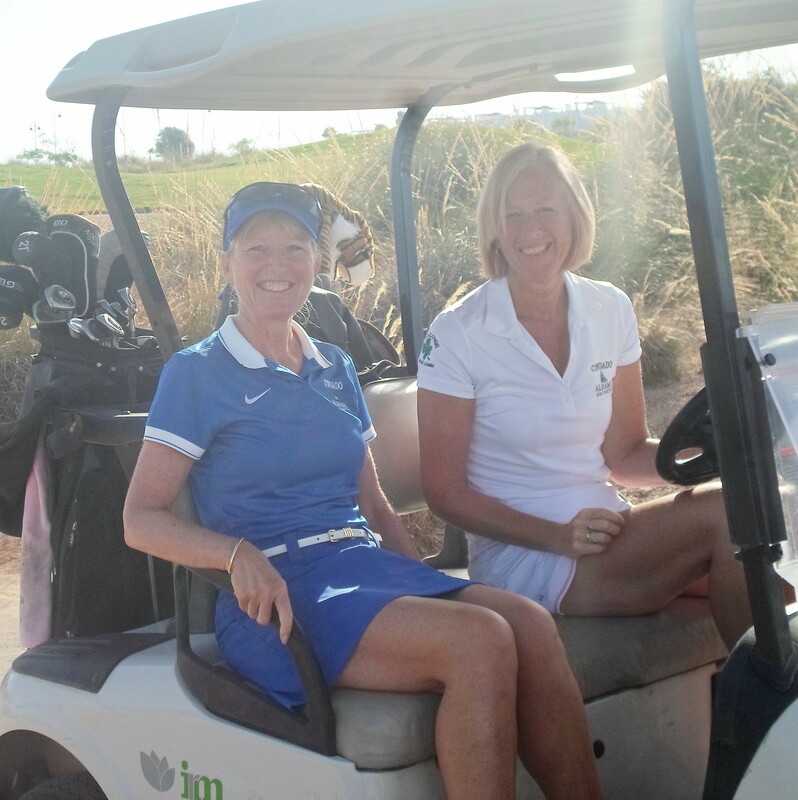 Alicia and Kim take advantage of the included buggy………..
Alicia with the staff photographer Heather Clarke……………. 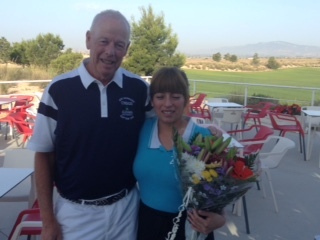 Jenny with her flowers at the Diversity bar……………. 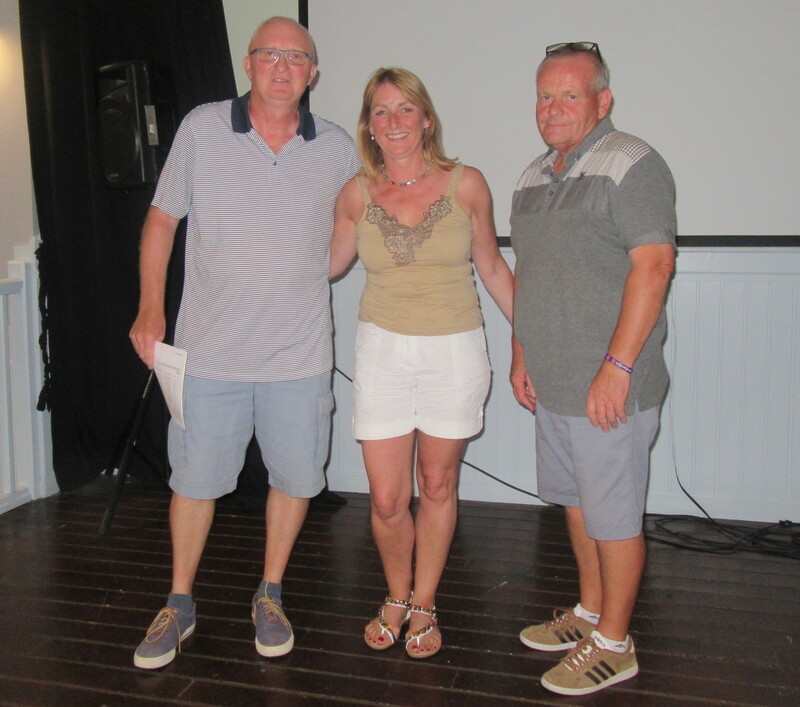 Ken decided to take photos of every team on the first tee…….thanks to Heather Clarke who borrowed my spare camera, and to Jeff at the Condado Club who presented a slide show in the function room as guests arrived……………. 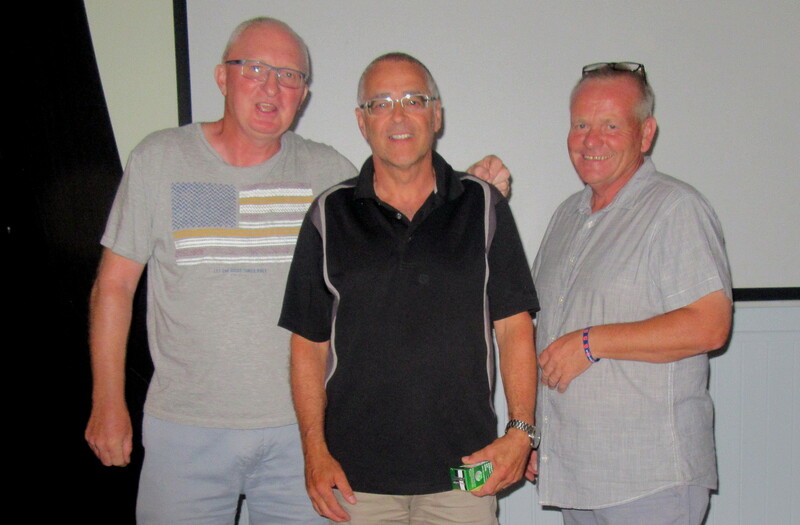 And from the Condado Club………………. 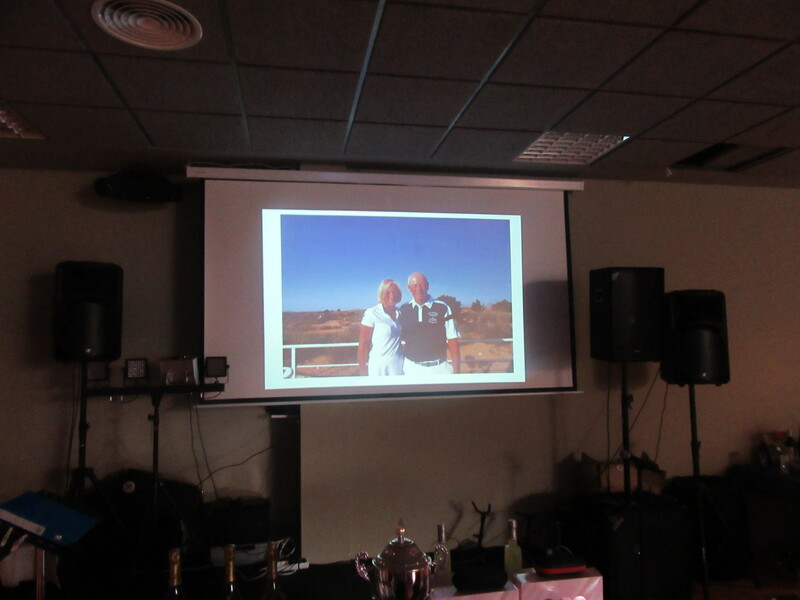 Ken & Alicia on the big screen…………….. 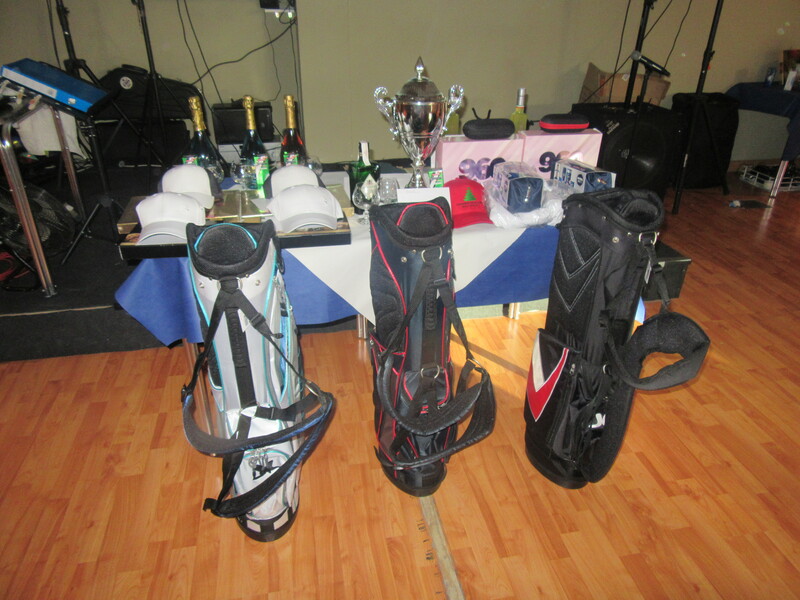 Thanks to everyone who donated prizes to the free draw…………………. 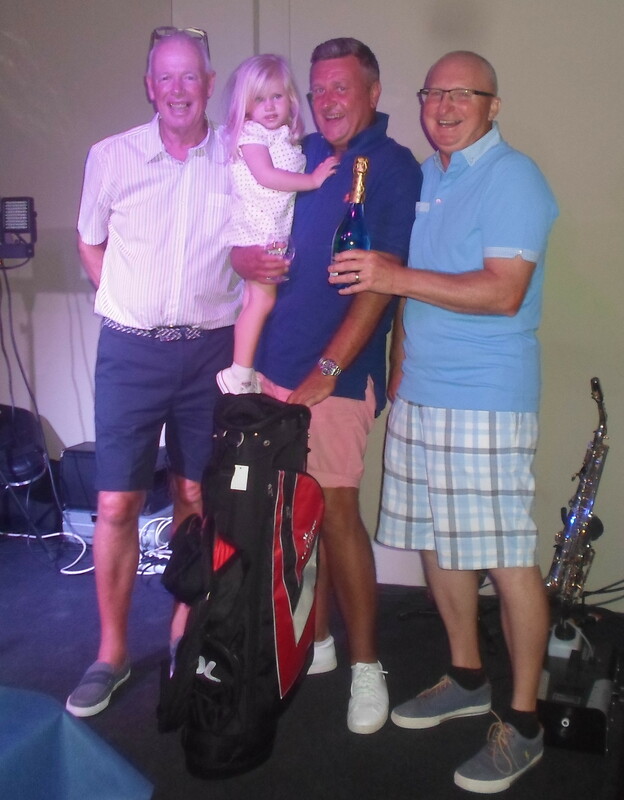 Ken and the winner, Phil Cooke……………. 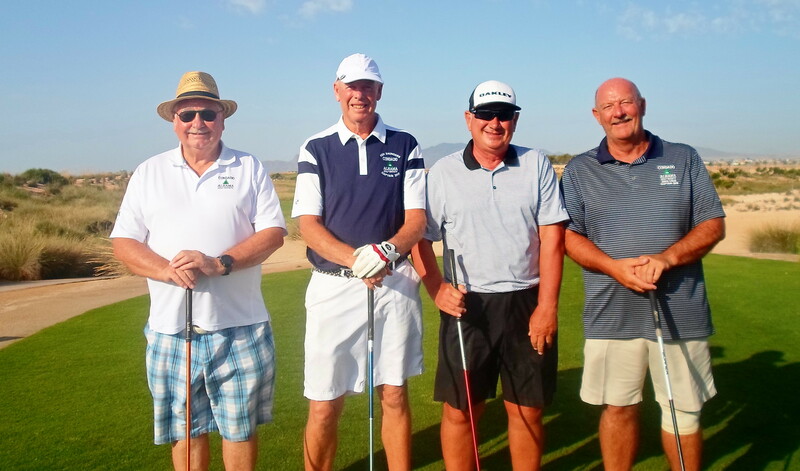 This week was Ken Saunders’ captains day competition with 47 players playing an individual stableford in hot summery conditions. 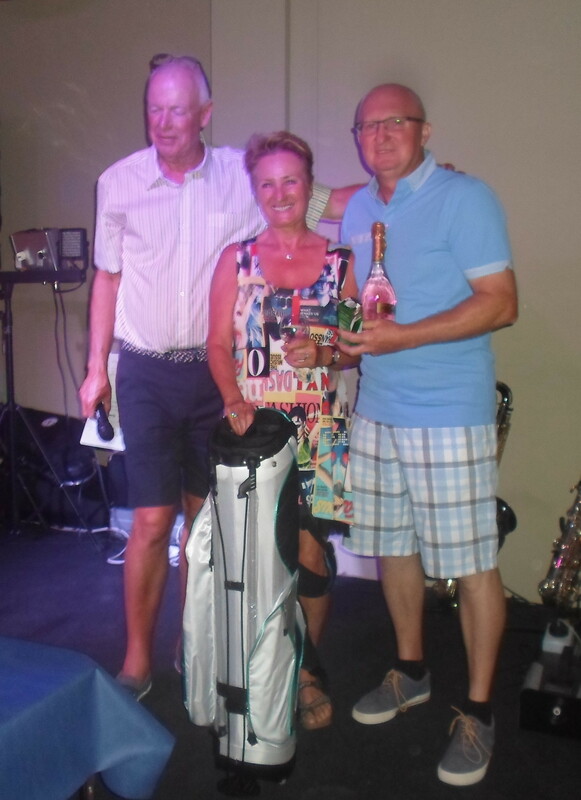 Ken’s vice captain, Phil Cooke, just pipped Kirsti Skardal to take the main prize. 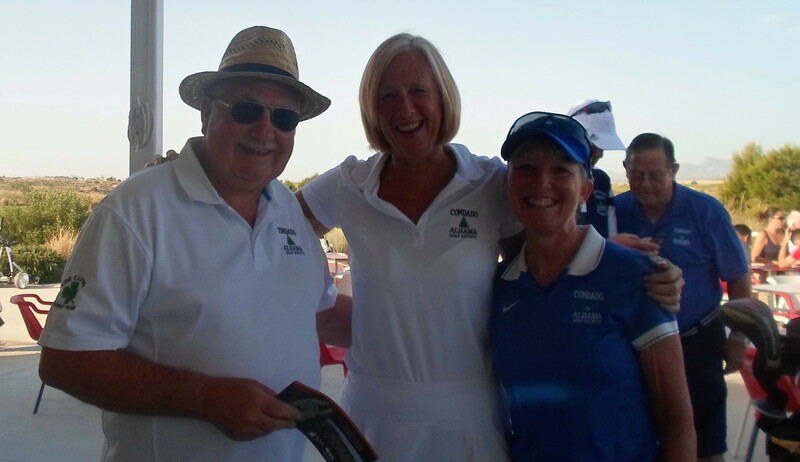 Ken even got into the prizes himself as runner-up in division 2. Tom won the 1st division. 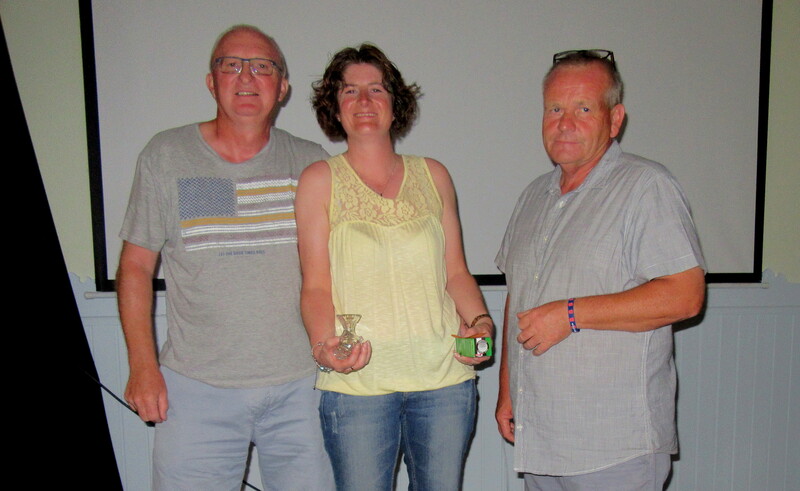 Kirsti was so close to the main prize………. 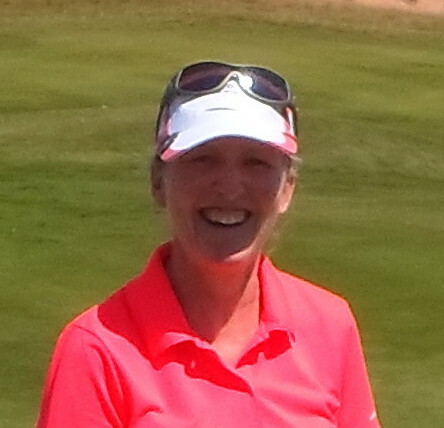 Christine was best on the long holes…………..
Kim was the par 3 specialist…………………. 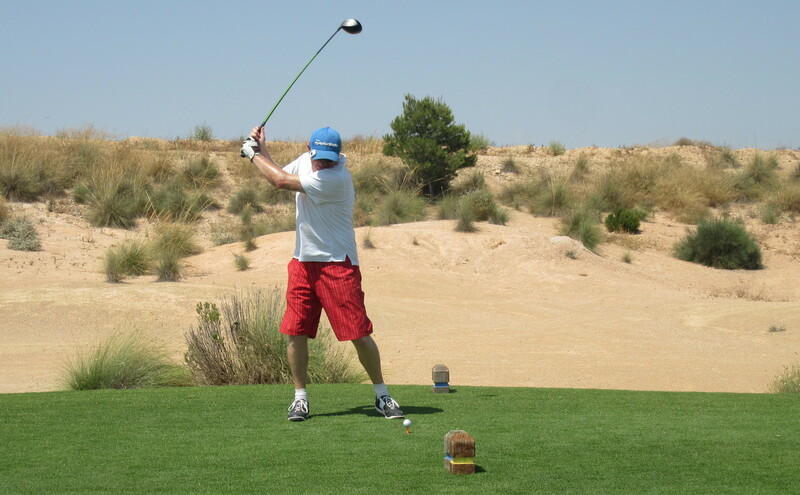 All the scores are available at handicapmaster.co.uk (see under links). 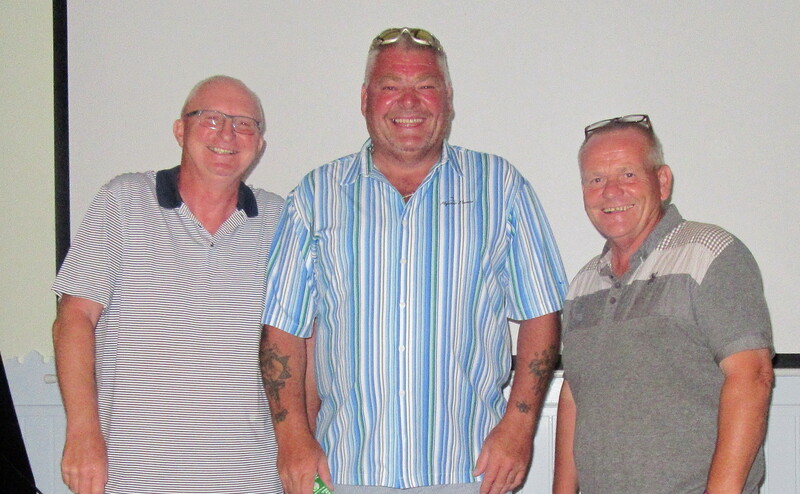 on our way to meet the snake – Barry Answer, Ken, me and Dave Lloyd………………. 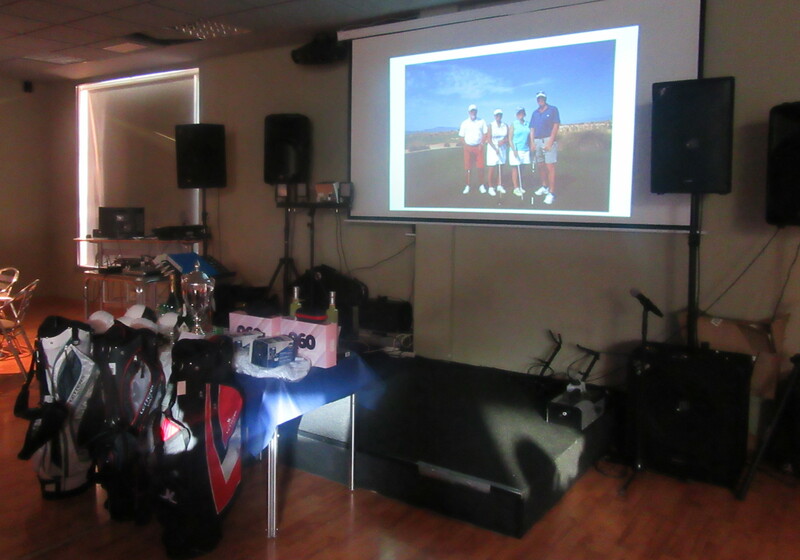 At the presentation a slideshow of all the players was on view behind the prize table. 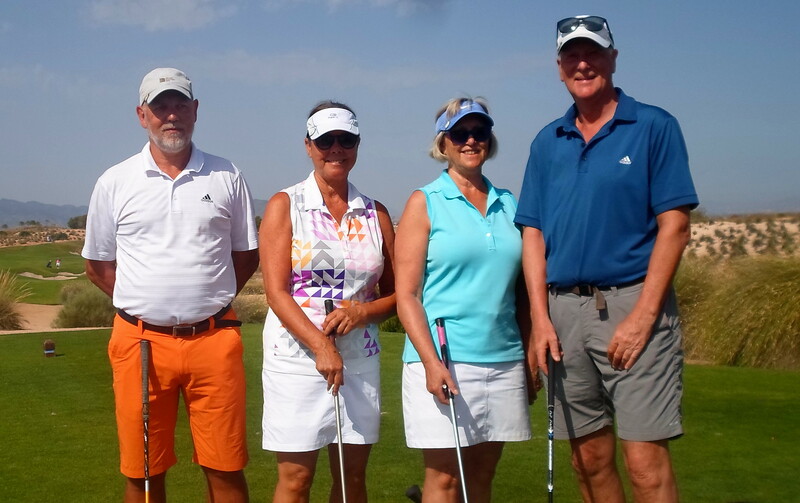 Thanks to Heather Clark who took photos on the 1st tee and around the clubhouse. 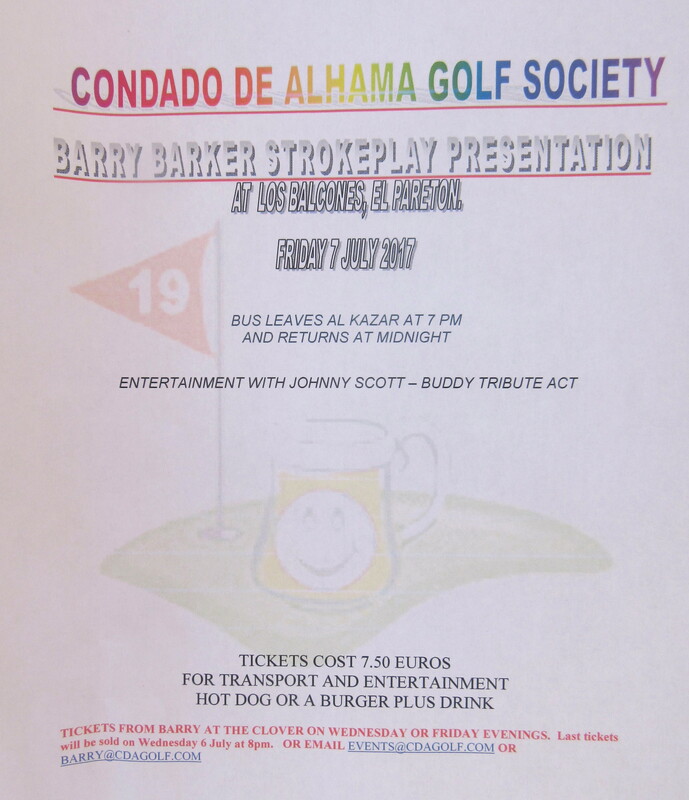 There were too many photos to include in this blog, so more pictures to follow (some on the CDA Golf Society facebook page). 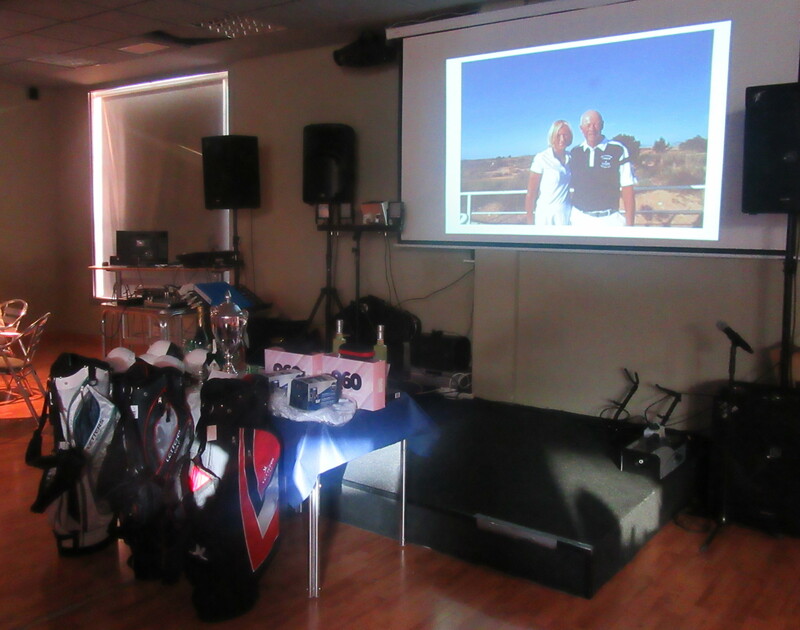 Ken & Alicia on the big screen………………..
Ken bought bouquets and gifts for several ladies who had helped him on his big day – Lynne Davies (starter), Jenny (Diversity bar manager), Cath (weekly sandwiches in the Clover), and special thanks to Alicia and Kim who organised the evening. 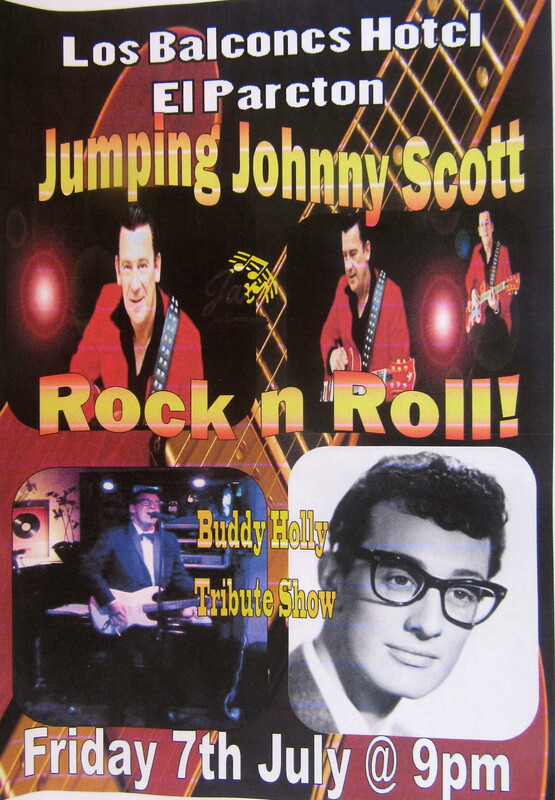 The entertainment was from G-Man, great saxophonist. 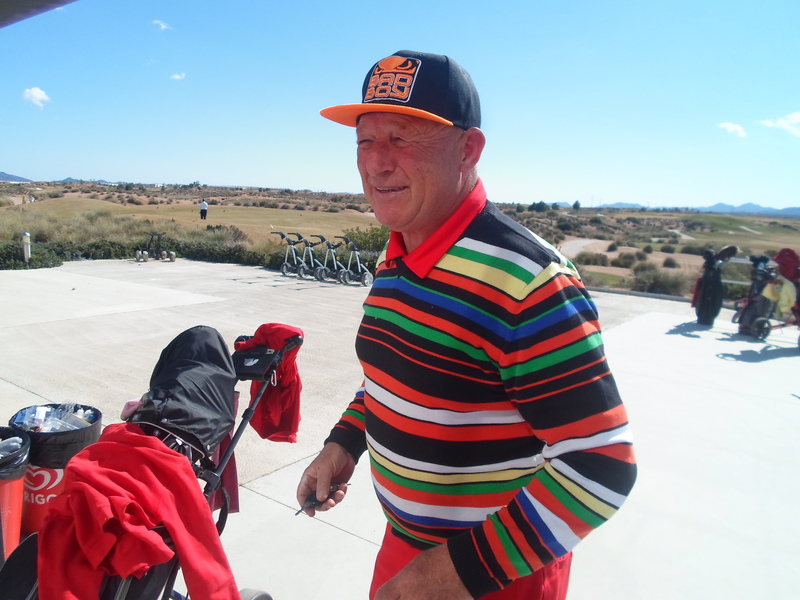 Ken also provided every player with a snack after golf at the Diversity golf bar – hot dog, chips and a beer which was much appreciated by all the golfers. 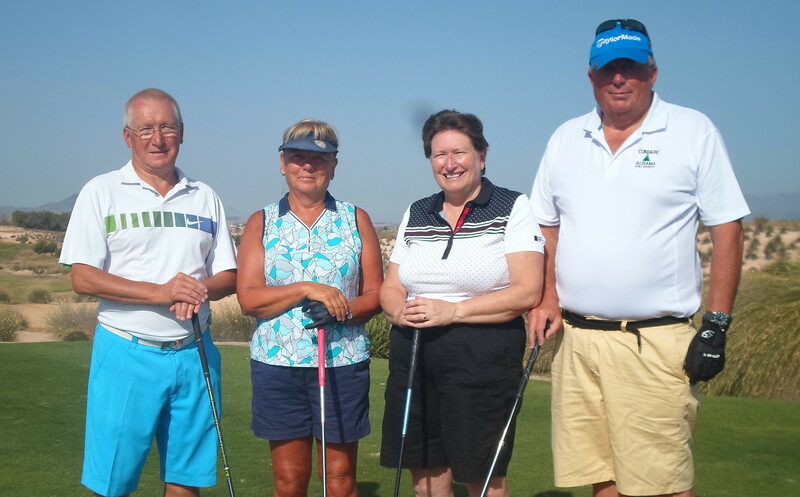 Next week is a 4 person team event – you can book yourself in online (be aware that there is no physical start sheet available in the clubhouse now) – book in Wednesday nights or online. 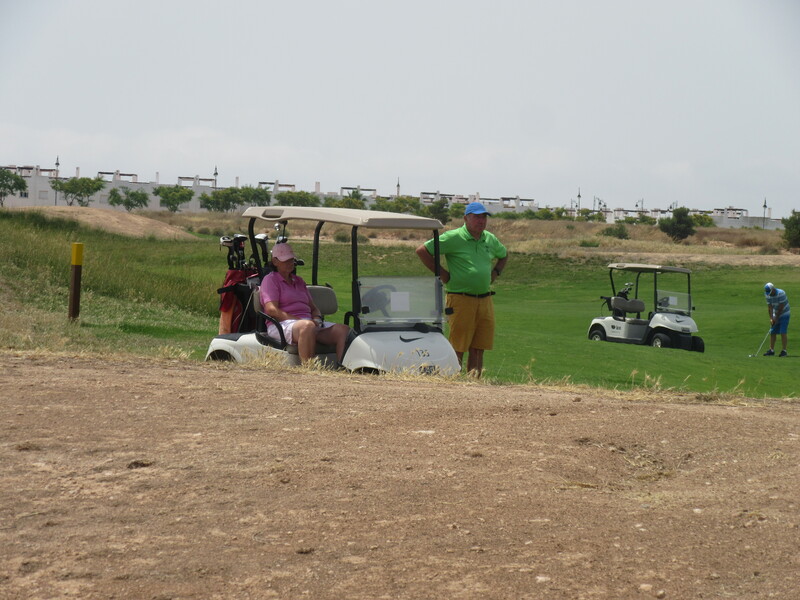 Also note that we are now into the summer season, which brings in discounts on green fees – now only 37€ (including buggy) plus 3€ insurance for those not in the federation. This will last throughout June, July and August. Whilst we make every effort to accommodate preferred Tee times please be aware that on occasions it may be necessary to change your booked time. 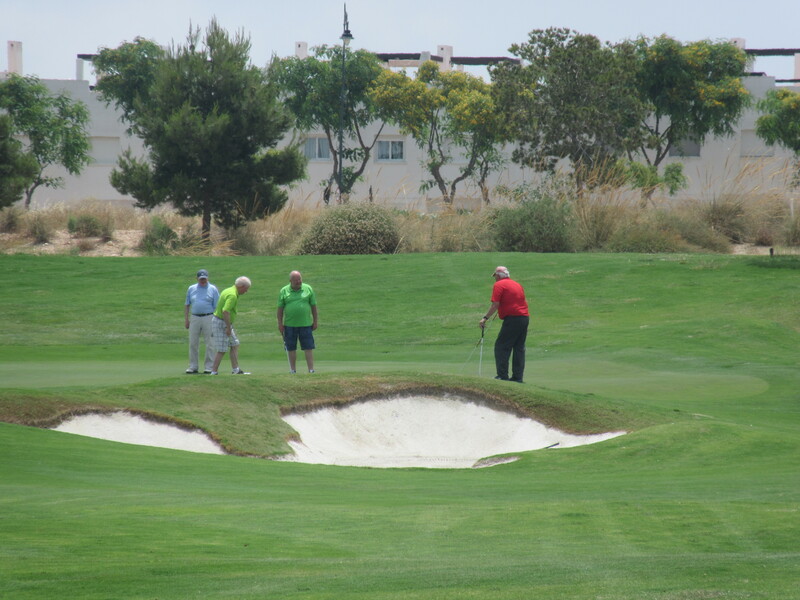 This will usually occur where we have empty Tee times in the middle of a start sheet, as we are obliged to release empty slots back to the pro shop for general bookings. Clearly we wish to avoid other groups playing in the middle of the society competition. 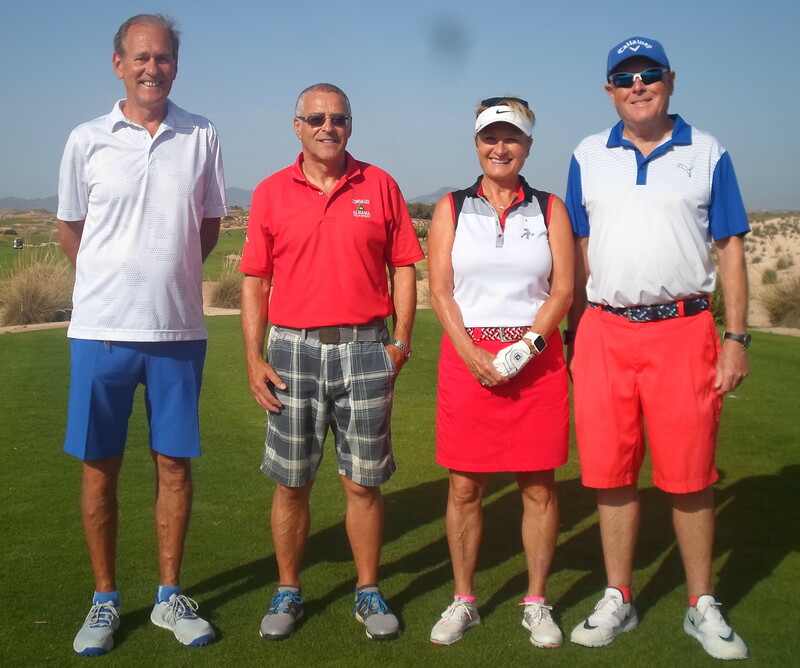 Can I ask that all player check their start times in master scoreboard 24 hours prior to each competition. Any changes will be kept to a minimum. 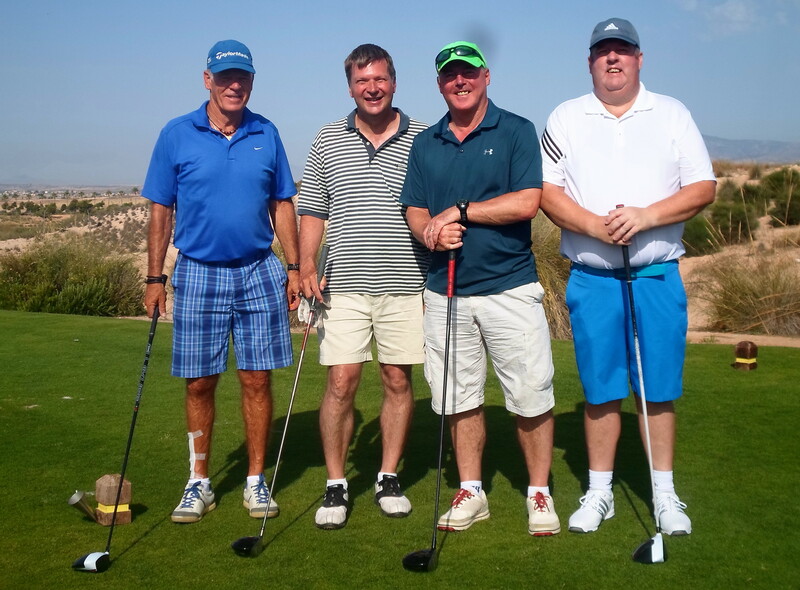 As I said, more photos to follow………………..